1968 Laverda 750 GT. Picture credits - Laverda. Submit more pictures. Laverda, originally an Italian manufacturer of combine harvesters, ptoduced their first motorcycle in 1947. Today the Laverda brand is owned buy Aprilia. And they are since 2004 a part of the Piaggio Group who quietly have closed all activities related to the Laverda brand. 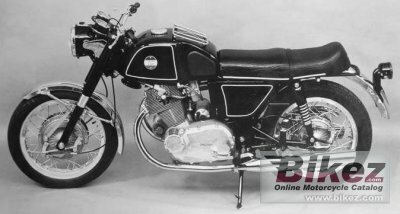 Laverda was at their peak of bike production in the 70�s. The agricultural equipment brand is famous for quality, simplicity, and efficiency; while the motorcycles in their day gained a reputation for being robust and innovative. The Laverda brand was absorbed by Piaggio, when in 2004, Piaggio absorbed Aprilia. Since, Piaggio has elected to quietly close all activities related to the Laverda brand, and has publicly stated that they would be willing to sell the rights to the brand if an investor should appear. Today, despite a parking website by Piaggio at Laverda.com, the brand is no longer in use. Ask questions Join the 68 Laverda 750 GT discussion group or the general Laverda discussion group.